A twins and multiple births report reveals regional variations in care, but how much can be read into the differences? A report into twins and multiple births reveals regional variations in care, but how much can be read into the differences? There are approximately 60,000 premature babies born in the UK every year. Being born too early can put babies at risk of lifelong health and development problems, has a major impact on families’ well-being, and is the leading cause of neonatal deaths. In November, health and social care secretary Jeremy Hunt announced an ambitious plan to halve rates of stillbirth, neonatal and maternal deaths, and brain injuries that occur during, soon or after birth by 2025 in England. Notifiable cases of stillbirth and neonatal deaths will now be probed by the Healthcare Safety Investigation Branch, and there could be a change in the law to enable full-term stillbirths to be investigated by a coroner. Both, it was announced, would enable families to find out what went wrong and why it happened. And in December an MBRRACE-UK collaboration surveillance report highlighted errors that could have been avoided if the right care had been provided. The Twins and Multiple Births Association (Tamba) says too often the focus of the NHS has been on the care provided to singleton births – and this has meant the rates of stillbirth and neonatal deaths in multiple pregnancies has remained high. Tamba’s report, Twin Pregnancy and Neonatal Care in England, highlights that multiple pregnancies are 2.5 times more likely to result in a stillbirth and five times more likely to result in a neonatal death. Overall multiple births account for nearly one in ten of all perinatal mortalities, despite only 3% of births being twins or multiples. 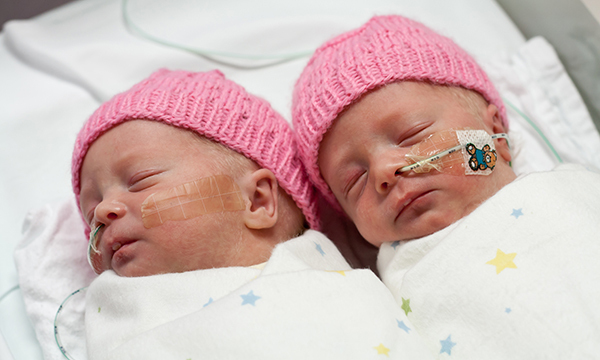 Tamba’s research shows there are more than 9,000 twins admitted to neonatal care each year in England, but this could be reduced by one third if all neonatal networks had the lowest rate of admission. Of the 16 networks, Thames Valley and Wessex had the lowest rate at just below 25%. This contrasted to the Southern West Midlands network where more than 88% of multiple births are admitted. The charity also looked at patient safety incidents, patient satisfaction rates and compliance with National Institute for Health and Care Excellence guidance, identifying wide variations in performance. Differences also emerged when the rates of stillbirths and neonatal deaths among multiple births was broken down by each network. Nationally the stillbirth rate for multiple births was 1.11% and for neonatal deaths it was 1.15%. But when you look across the neonatal networks stillbirths ranged from 0.16% in Trent to 1.85% in east England and neonatal deaths from 0.44 in north west London to 2.49 in south west Midlands. It is estimated in the report that if all networks had the lowest rate on each measure, 420 lives a year could be saved. And what was noticeable was how networks with fewer multiple births tended to have the worst figures, something Tamba says needs reforming. She would like the programmes that are under way, such as the Maternity Transformation Programme, the Neonatal Transformation Review and the Maternity and Neonatal Safety Collaborative, to learn from some of the best-performing networks identified by Tamba. But how much should be read into the differences? After all, the mortality rates take no account of socio-economic status, which could influence outcome regardless of whether high-quality care is provided. Poor and black or Asian women have a higher risk of stillbirth or neonatal death for example. The relatively small number of deaths also means small fluctuations in deaths by pure chance could skew the results. And Mr Reed says some of the differences may not always be about quality of care. On admission rates to neonatal care, for example, he says some of the higher rates could be because staff are more cautious with multiple births. He believes more neonatal transitional care – a kind of halfway house between the maternity and neonatal – could help. Audits suggest less than half of hospitals have such facilities, although there is a push to introduce more. Scotland is a year into a five-year plan for maternity and neonatal services. The plan does include guidance on multiple births which Tamba has welcomed. But plans to concentrate neonatal intensive care at three sites raised concerns about accessibility for families who will have to travel to larger centres. It is estimated that about 40% of multiple birth babies need neonatal or special care. Miranda Morgan’s pregnancy with twins went smoothly, but the thought of what could go wrong was always there. 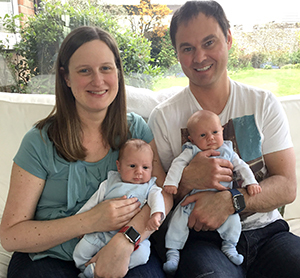 The 36 year old says: ‘I’m a GP so I know the risks are higher with twins. I know what neonatal care is like and we did a tour of the unit so everything was explained. She gave birth via caesarean section at 38 weeks to two boys, Rafe and Lance.